es, the rumors you've heard are true. Notorious Milwaukee serial killer, necrophiliac, cannibal, and amateur taxidermist Jeffrey Dahmer did attend Ohio State University—albeit only briefly. It was the fall of 1978, the high water mark of the Seventies. 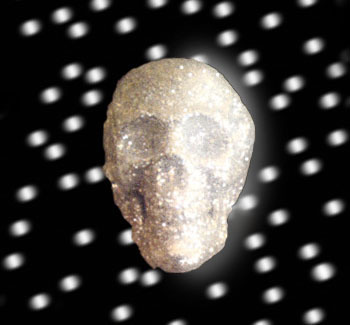 Jimmy Carter was president but disco was king. The kids were wearing long, poorly groomed hair, bell bottom jeans and tight rayon shirts with big collars and loud prints. People actually wore polyester without shame or self-consciousness. Customized vans and Chevy Novas with tanks full of cheap leaded gas rumbled down the road blaring Billy Joel, the Commodores, Chicago, and the Bee Gees on their eight-track players. Everybody was laughing along to the antics of "Samurai Optometrist" and the "Wild and Crazy Guys" on Saturday Night Live. Grease was the hot movie. Meanwhile, Dahmer, just weeks out of high school, had already claimed his first victim. At the time, the future cannibal was living alone in his father’s house near the well-to-do Cleveland bedroom community of Bath, Ohio. His parents were going through a nasty divorce and neither was living in the family home at the time. On June 18th, Jeffrey Dahmer had gone out driving and picked up teenage hitchhiker Steven Hicks. Hicks was trying to make his way to a concert at Cleveland’s Blossom Music Center. He was shirtless and Dahmer liked the look of his bare torso. The two bought some beers, went back to Dahmer’s home, and drank them. When Hicks tried to take Dahmer up on his offer to give him a ride to his girlfriend’s, Dahmer produced a barbell and beat him to death. For a motive, Dahmer could only offer that he hadn’t wanted Hicks to leave. Others have speculated that Hicks spurned Dahmer’s sexual advances and Dahmer murdered him for that reason. Whatever the reason, the novice killer carefully cleaned up the splattered blood and brains of his victim and hid the body in the crawlspace beneath the house until he had an opportunity to dismember it, stuff the parts in plastic bags, and bury them individually in scattered graves in the woods surrounding his home. About a year later, Dahmer dug up the scattered pieces, now denuded of flesh, and used a sledgehammer to smash all the bones to tiny pieces which he scattered in the woods. Other than becoming a murderer, Dahmer at 18 wasn’t doing much. He was passive, directionless, and detached from the world around him. He seemed to have no goals or ambition. He didn’t want anything, want to be anything, or much care what became of him. He was content to just sit around the house, drinking beer, smoking the occasional reefer, and watching television all day, rarely saying anything more than “Yes” or “No” to anybody and then only when questioned directly. Unsatisfied with the direction their son’s young life was taking, the Dahmers enrolled their son at Ohio State University for Fall Quarter 1978. Ohio State had open admissions back then. If you were an Ohio resident and could graduate from high school with decent grades, you could get in. The Dahmers hoped that college might ignite a spark in the boy and get him back on the road to a decent life. 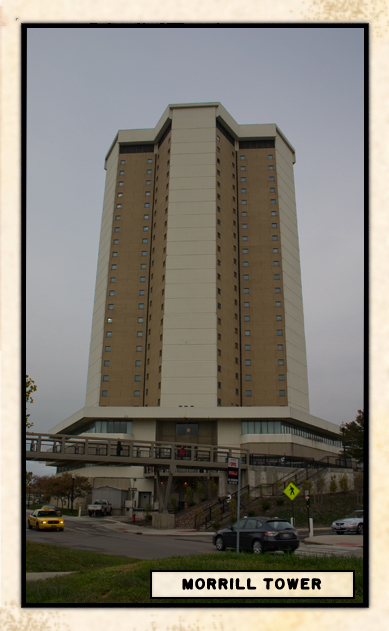 In September, his father and stepmother moved him into a room in Morrill Tower. His room was 540 or 541, a quad he shared with three other roommates. Dahmer had his own bedroom but shared a living room and bath with his roommates. He decorated his tiny room with a snake skin, pictures of his dog, and row upon on row of emptied beer, wine, and liquor bottles. College was his parents’ idea—not his—and Dahmer showed little enthusiasm for it. He quickly fell into a routine of walking up to the South High Street bars and carry-outs in the late afternoon, getting stupid drunk, staggering back to his dorm in the wee hours of the morning, collapsing in his bed, and sleeping till the next afternoon when he rose to do it all over again. If it wasn’t too inconvenient, he occasionally stopped by a class or two. Supposedly, on those occasions when he did report to class, he would sneak in liquor in a soda can and get drunk during the lecture. When questioned thirteen years later, Dahmer’s roommates barely remembered him and what they did remember was unfavorable. He was no more involved or connected with life at college than he’d been with life at home. He was a loner. He drank, he slept. He said no more to anyone than was absolutely necessary. He made no friends. Even Dahmer’s fellow students, inured to the heavy drinking that is the social scene at most colleges, whispered to one another that their sullen, solitary roomy was clearly an alcoholic. His roommates took an instant dislike to him. Tensions grew. They complained to the resident advisor and were told to work it out amongst themselves. The roommate with the strongest objections to Dahmer moved to another suite when there was a vacancy. They also recalled that he was a suspect in some thefts in the dorm. He was detained and questioned by campus police in November 1978 about the theft of a radio, watch, and $100 cash from the room during a party but no charges were ever filed. As the quarter progressed and the weather turned colder and wetter, Dahmer became less willing to go out. He took to buying cases of beer and bottles of wine and whiskey and consuming them alone in his dorm room bunk until he passed out. Drinking wasn’t cheap and Dahmer quickly ran through the money his father sent him to live on. 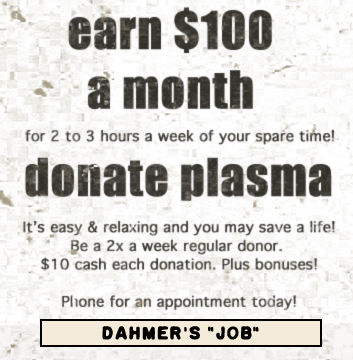 To make ends meet, the future serial killer sold plasma and blood at a South Campus blood bank for $10 a pop. Young Dahmer became such a frequent visitor that his name was put on a list with hard-core junkies and winos whose visits were restricted for their health’s sake. Too frequent plasma donations probably didn’t make it any easier for him to wake up and attend his morning classes. By December, when the quarter ended, Dahmer had failed almost every one of his courses. In Introduction to Anthropology, Classical Civilization, and Administrative Science he received failing grades or incompletes. In Riflery, the only course he managed to attend with any regularity, he pulled a B-. His overall GPA was an appalling 0.45. The university initiated moves to expel him. When Dahmer returned home to Bath, he made lame excuses for his performance. He couldn’t manage to wake up in the mornings to attend classes, he told his dad. His angry father wasn’t buying the excuses and gave him an ultimatum: get a job or join the Army. Dahmer seemed relieved not to be heading back to college but he made no move to get a job. When his father dropped him off at an Ohio Bureau of Employment Services office in a nearby mall, he instead found his way to a bar and ended up getting arrested on drunk and disorderly charges. Disgusted, his father drove him to the local recruiting station and enlisted him in the Army. So ended Jeffrey Dahmer’s time at Ohio State. According to his 1991 confession, Dahmer killed no one during his quarter at Ohio State. Pretty much all he did was drink himself into a stupor. In fact nearly a decade would pass between his first murder and the beginning of the series of sixteen murders for which he is notorious. Just to be sure though, Columbus and Central Ohio police checked over their case files for the period but found no unsolved late 1978 cases in which Dahmer could have been involved. They wondered if he might have been involved in an unsolved 1986 sexual mutilation killing near campus, possibly on a return visit to Columbus, but it turned out that Dahmer was nowhere near the area at the time. The campus legend that Dahmer used Mirror Lake as a body dump is untrue. Still, when you’re on campus, it’s pretty creepy to think you might be walking the same sidewalks, sitting in the same classroom, or even sleeping in the same dorm room that was once occupied by a human monster. Also makes you a little uneasy about your fellow students. Dahmer didn’t look that abnormal after all. His dormmates knew they were rooming with a drunk but none of them guessed he was also a killer.